Of course I did my homework ahead of time, and found a couple places that I wanted to try. 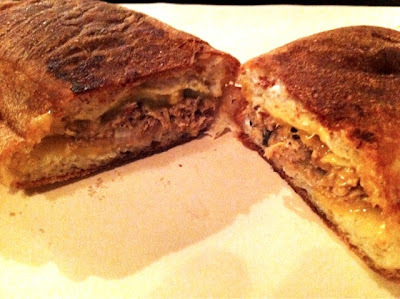 First one on that list is: Bunk Sandwiches. There are currently 2 locations, one in down town Portland, and the other on the other side of the river. After reading numerous reviews on long line ups, I went in favour of the one not in down town. This place reminded me of Meat and Bread, except the décor was not so urban and the lighting was terrible. The one and only sandwich I had in mind was the Cubano ($9). 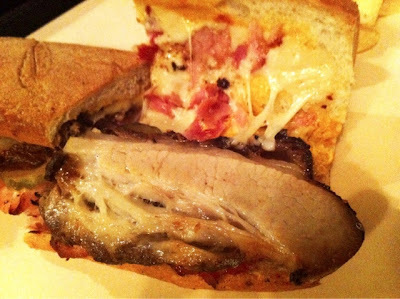 It was sinnfully delicious, the pork belly is melt in your mouth tender. The panini styled bread was crispy on the outside, but still very moist and soft on the inside. So is there a downside to this sandwich? Well, when I was eating it, the 'pickle juice' kept running down my hand, or so I thought. It wasn't until the 3rd time, R finally said I think that's oil. What do you know, it was. Despite being that oily, it really didn't feel that way when I was biting into it. All I know is, I am definitely getting another one the next time I go. R got the Albacore Tuna melt ($9). 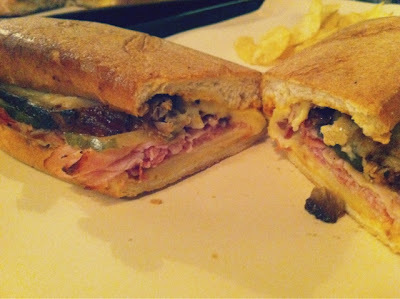 The bread was just as good, but it just paled in comparison with the Cubano. Really, how can it compare, it didn't have the rich flavors nor a interesting combination of textures. I am not saying this was a horrible sandwich, in fact it was pretty good according to R. I thought the tuna was a bit dry, but mind you I just had a super 'juicy' sandwich. Now if you want something less greasy, definitely go with this one. 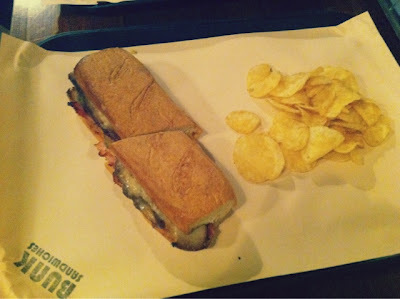 All their sandwiches come with a side of chips, it was nothing special, these were just your plain Kettle chips. I do have to say, out of most brand, this is the one I prefer the most. 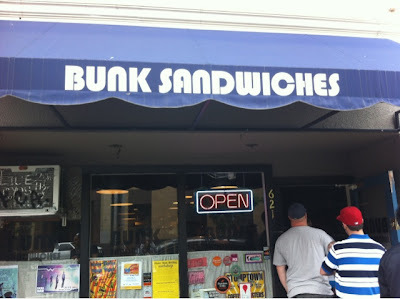 I loved Bunk Sandwiches, they certainly knows what they are doing. If you are ever in Portland, definitely head over there for some delicious food. Also the no tax even at restaurant is certainly a plus.